As an ex-resident of the West Island, I’m happy to say that I still frequently go back and visit. 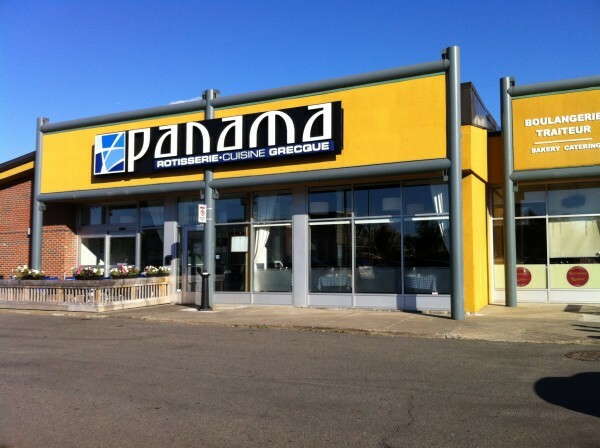 Panama has been one of the newer, ‘trendier’ restaurants to appear in Dollard-des-Ormeaux, along with the installments of La Verita and Panne Pazzo by Marche de l’Ouest. After hearing several acquaintances praise the Jean Talon location of Panama for their authentic Greek food, we decided to try it closer to home. Our energetic server gave us a warm welcome and explained Panama’s philosophy on food and dining style. Meant to be consumed family-style, she highly encouraged us to take dishes to share amongst us as opposed to everyone getting one dish for themselves. She went on to highlight some of the most popular dishes and their methods of preparation as well as a rare special – lamb from the previous evening, usually served only on Fridays and Saturdays. Mentioning that the owner is adamant in keeping the quality between the three Panama locations consistent, many of the dips and the ingredients come from the original kitchen in Jean Talon, which is aligned with what has been said on various food forums such as Chowhound and Yelp. Alright then. We started off with a pitcher of white wine sangria. It was sweet and easy to drink – it hardly tasted like there was any alcohol in it at all! 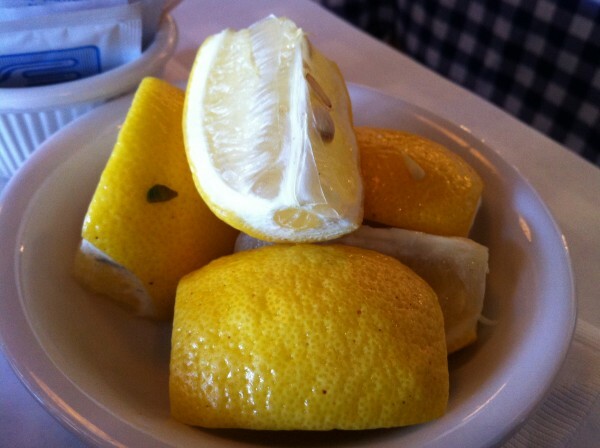 A scant handful of maraschino cherries sat at the bottom while some lonely slices of lemon and limes floated at the top. I would have loved to see more fresh fruits in there. It would have made the sangria taste that much better! 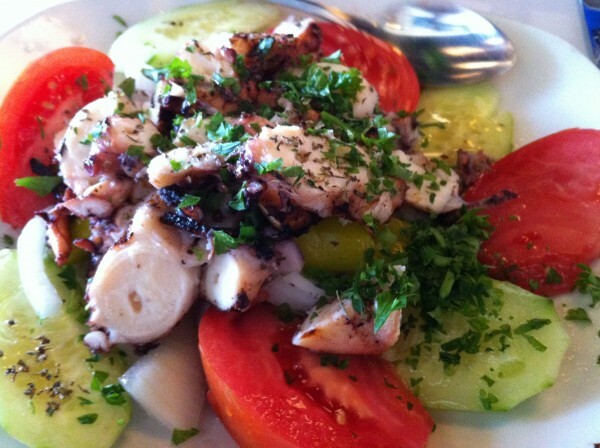 We had a mix of cold and hot appetizers – fried octopus, a mix of fried zucchini and eggplants and tirokafteri, a dip had with crusty bread. The fried octopus was unanimously our favorite amongst the trio of platters. 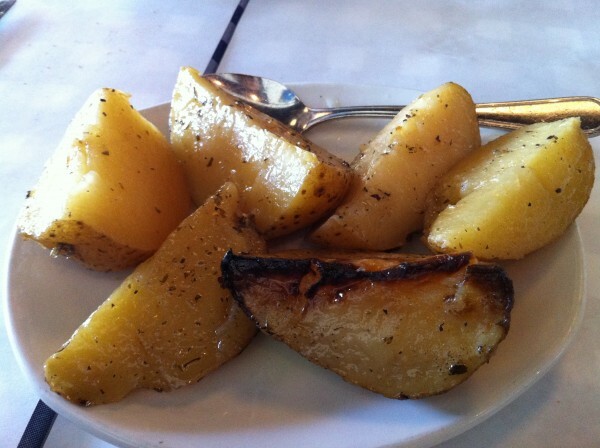 They were thickly cut, juicy and very tasty with a squirt of lemon juice on top. Tender and served at a warm temperature, some of the pieces still had the suction cups on them… My fav. Plus, there was plenty to go around. 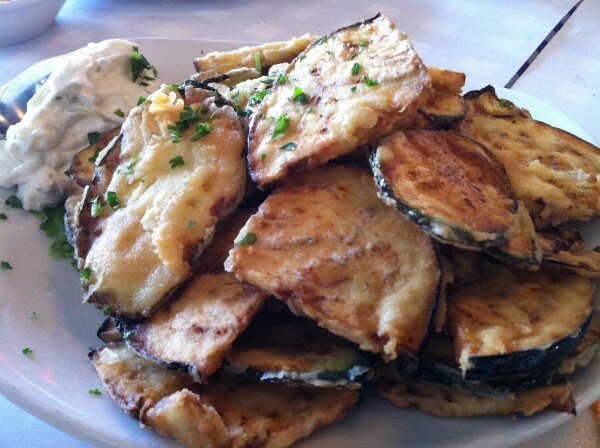 Both the zucchini and the eggplants were sliced in thin pieces, dipped in batter and expertly fried so that each bite was light with a bit of crunch. Paired with a dollop of tsatziki… a truly addictive snack. You just keep on popping them in! 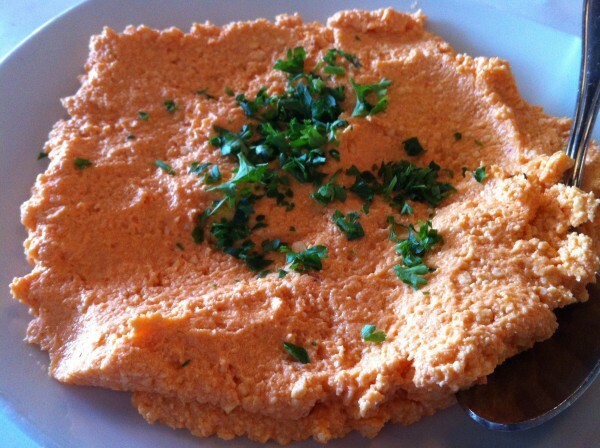 Lastly, the tirokafteri, a mix of mild and spicy red peppers blended with feta cheese. Spread on top of a piece of bread, this one was bold and full of flavor. With a heavy dose of saltiness coming from the feta, this one was great with the bread, but alone became more difficult to eat. If you’re a feta lover, get this! We shared the six lamb chops and four pieces of sea bass. 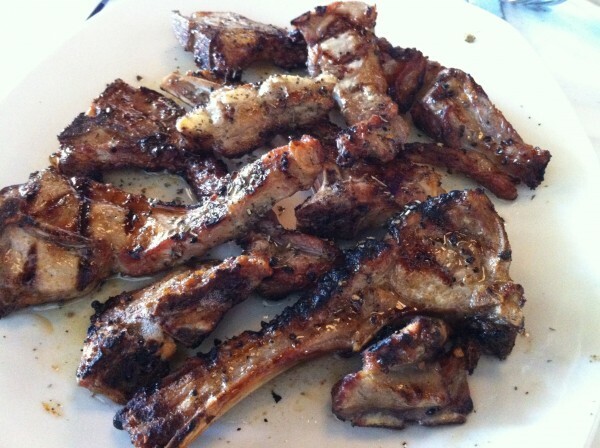 Bringing forth a platter filled with lamb on the bone, we tore in with our bare hands. The lamb was good, but it didn’t stand out. It was neither bad nor good – just fine. Overall, we had a great experience. 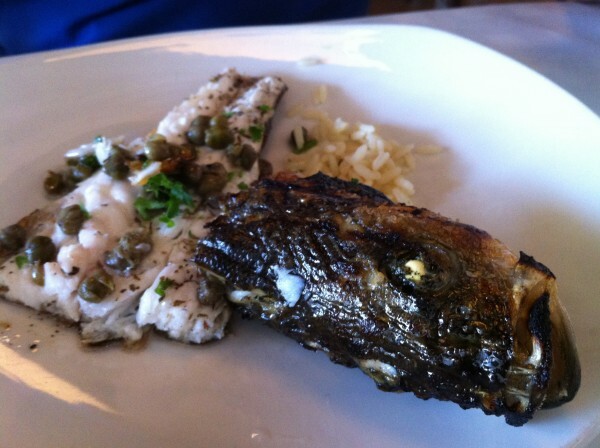 The food on the whole was well prepared and gave us an exemplary ‘taste of Greece’. Tags: Capers, Dinner, Eggplant, Feta Cheese, Fish, forkandtell, Fried, Greek, Grill, Lamb Chop, Mild, Montreal, Octopus, Red Pepper, Roasted, Sea Bass, Spicy, Zucchini.